Businesses, groups and individuals across Hartlepool are busy in preparation for this year’s annual Purple Week in aid of Alice House Hospice. The campaign starts on Saturday 23 April and is themed around the local charity’s familiar purple branding. During Purple Week, people are encouraged to ‘go purple’ to help raise money and awareness for local hospice care. How people take part is completely up to them – it could be a purple raffle in the workplace, a ‘wear purple’ day, a purple themed fundraising event, or any other project that helps to generate funding or awareness for patient services. This year, Purple Week is being launched by Utility Alliance, who have been supporters since 2017 and are now into their second year as patrons of Alice House. 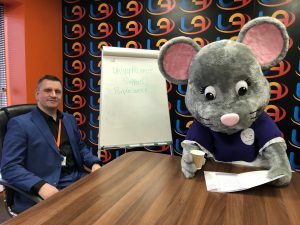 The business’ head office, based on Hartlepool Marina, were recently visited by Hospice mascot Alice Mouse who was joined by UA staff members keen to show their support. The team at Utility Alliance are working on fundraising plans for the week and are looking forward to having fun raising plenty of money for their nominated charity.